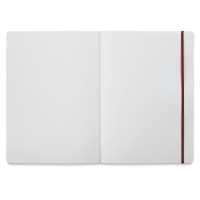 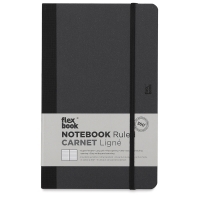 Featuring a deluxe European design with a patented 360° binding, Prat Flex Books open completely flat for ease of drawing, writing, and scanning. 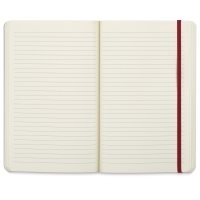 Notebook — Inside every Prat Flex Notebook are 192 pages of ivory-colored 80 gsm Italian Fabriano paper that is acid-free and chlorine-free, ideal for writing with pencils, ballpoint pens, roller and fountain pens, and markers. 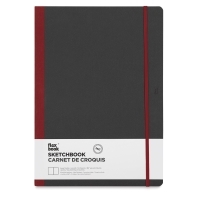 The cover is Fedrigoni Saville Row Tweed uncoated board with a fabric texture, cloth spine, and elastic closure. 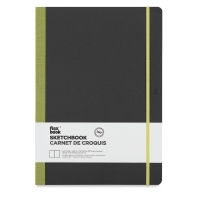 Sketchbook — Inside, the German-made 170 gsm white paper is acid-free and chlorine-free, ready for sketching with pencils, charcoal, markers, and pastels. The cover is constructed of Fedrigoni Saville Row Tweed uncoated board with a fabric texture, contrasting spine, and elastic closure. Prat Flex Sketchbooks contain 80 blank pages.